מאת יובל ~ 13 בספטמבר, 2010. בקטגוריית: English, ארגנטינה, יין, יקבים, מדריכים. I woke up and decided to visit one last winery. I found out what bus I have to take and about an hour later the bus driver told me to get off at a certain junction. I started walking on Las Margaritas Road until a couple of girls stopped for me. They were also on the way to the same winery as I was headed for, what luck. 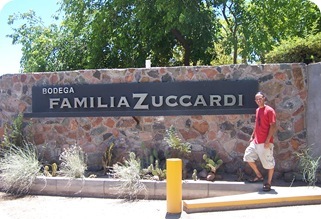 We arrived at Bodega Familia Zuccardi, and I thanked the girls for the ride. They planned to take the tour while I walked into winery for tastings. I was greeted by Ben, an Australian volunteer at the winery. He told me to pick 5 wines for tasting for only 5 pesos. I picked 3 that I would have liked to taste, and Ben recommended 3 more (yes, that's 6). The first was a sparkling rosé Pinot Noir 2007, then a Viognier 2007, a Reserva Tempranillo 2006, a Reserva Cabernet Sauvignon 2006, a Seire A Bonarda 2006, and a Q Malbec 2005. The Tempranillo had great aromas of vanilla, nutmeg, and more unrecognizable spices, with flavors vanilla and oak and a dry aftertaste. 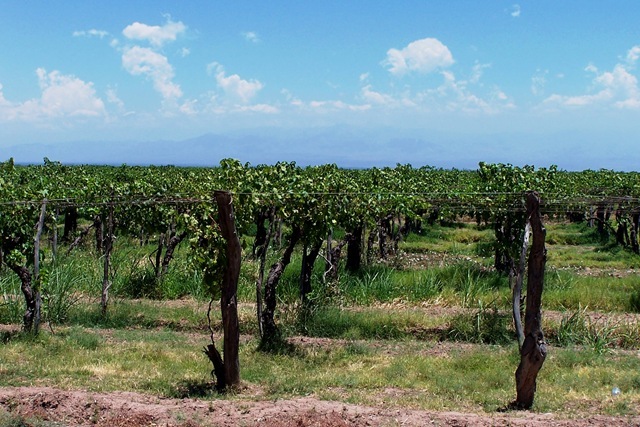 I was surprised when the Cabernet also had hints of vanilla in its aromas and flavors. Both reserves were real good wines. The Seire A Bonarda was very good. The wine had cherry berry and light oak aromas, with some of the same flavors and leather as well. It had a great fruity aftertaste, it lingered in the mouth for the exact amount of time. 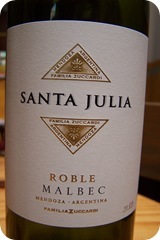 The Malbec Q was especially good with oak and tobacco aromas, and hard herb flavors with a round fruity oaky finish. Ben noticed that I enjoyed myself immensely so he decided to make my stay even more enjoyable. He took me to the "experiment room". When we arrived I saw up to 20 stainless steel tanks about 5 cubic meters each one, an amazing sight. Ben explained that this is where a lot of experiments were done on all kinds of the different winery's grapes. With the glasses Ben brought for us he recommended we first try the Sangiovese 2007. The wine dripped slowly but surely into the glass until it was full enough for a few sips. 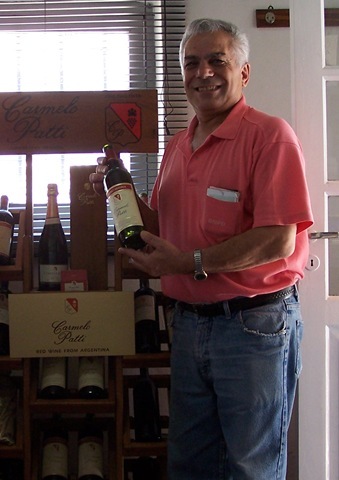 The wine's aromas and flavors were hard because of its young age, but it was still a delicious wine. 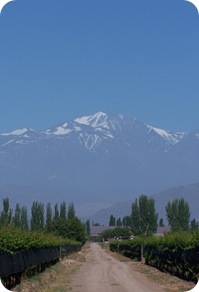 The next wine we tasted was a future Z 2007, a blend of Tempranillo and Malbec. As I smelled and tasted this wine, future potential just flowed out of it in such an extraordinary manner. The Z had aromas and flavors of vanilla and spices, with fruity aftertaste that I wanted to last a lifetime. This Z will be such an amazing wine. As we were walking out I asked Ben if we could taste one more wine. He said no problem, and I pointed towards the tank that read "Pinot Noir 2007". This wine had extraordinary aromas of bananas, sweet candy and gum. 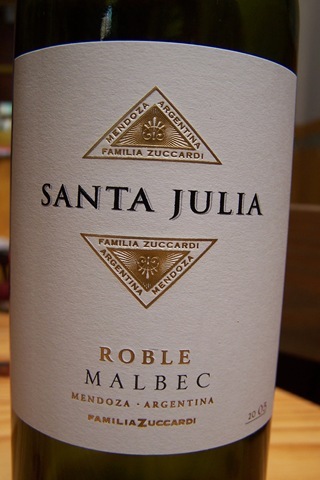 It had amazing berry and orange flavors with a great banana finish. It reminded me of banana ice cream. As we walked back to the main building, I couldn't stop thanking Ben for this experience. Ben continued on with his work while I strolled around the wine shop and decided to buy a T-shirt, a couple posters, a bottle opener (my 14th), and of course a bottle of wine. I had such a good time at this winery. I packed my backpack with my new wine articles and went outside and hitchhiked back. After 5 minutes a car with some of the bodega's workers stopped and offered to take me to the nearest junction. I thanked them as they let me off near Route 7. 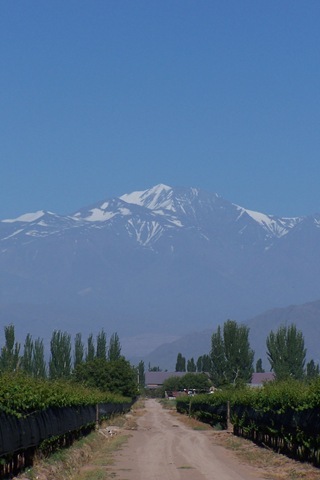 Ten minutes later I got on a bus back to Mendoza. Wednesday glorious Wednesday. After a quick shower, I walked over to The Vines of Mendoza for another Winemaker's Night. I arrived early as usual and hung out with Yael , telling stories of the last few days. 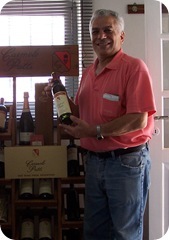 Yael told me that for Winemaker's Night, Carmelo Patti is the guest winemaker. Shortly after she informed me of this, Sr. Patti came strolling into the bar. I was happy to see that he remembered me as he shook my hand. I told Yael that I would see her around and followed Carmelo into the air conditioned room where his narrative was going to take place. I talked to him about wine as one of the waitresses poured him some of his wine. He called ahead of time and told them to decant one bottle of his Malbec 2005. After he tasted it, he told me to taste it as well. The wine was just brilliant. Carmelo offered some advice about decanting wines, and because he knows his own wines best, he recommended to decant his wine. He politely said goodbye as he had to go set up his things. As a starter they served the Gimenez Riili Perpetuum Sauvignon Blanc 2007. Soon enough the whole room was full of people and the evening started as the translator introduced Carmelo Patti and his first wine was served. 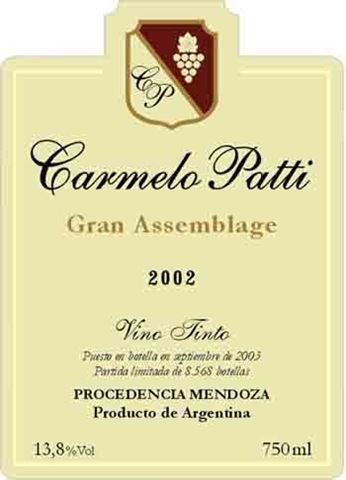 Now that I tasted his Reserva Malbec 2005 again, but this time without decanting it, I knew what Carmelo meant about decanting his wines. The wine literally stayed closed and did not show almost any of its true aromas. The evening's next wine was the Reserva Cabernet Sauvignon 2003. The wine exhibited great aromas of cherry and spices, together with smooth oak leather and ripe plum flavors, with a round oaky finish. Sr. Patti explained that this wine should also be decanted. The evening's last wine, which was decanted, is the Gran Assemblage 2004. This special blend had great cherry berry and oak aromas, flavors of oak tobacco and plum, and a strong oaky finish. I was in heaven drinking such good wine. After the evening was over I thanked Carmelo for making great wines. I then went over to Yael and made a reservation for tomorrow for the free tastings that I received from Anna from Bodega Pulenta Estate. During the evening I met an American and an Argentinean who were also traveling alone. After leaving the wine bar we headed onto Aristides Villanueva St. to finish the night with an Argentinean steak and a couple more bottles of wine. כרגע קראתי את היום הזה שוב, וזה פשוט לעצום את העיניים ולחיות את היום הזה שוב. פשוט מדהים, היה כ"כ כיף. אני ממליץ לכולם לעלות על מטוס לארגנטינה ואח"כ על אוטובוס למנדוזה ולבלות שם כמה שיותר זמן. מתי אתה מתחיל לייבא יינות של כרמלו? שכה יהיה לי טוב לא נשארת לארוחת המופלאה שלהם? אם אני לא טועה ב-40 פזו (יוקרתי לאזור…) מקבלים ארוחה אחת אפיים. במרפסת נחמדה מתחת לגפנים, מספר מנות כפריות וקינוחים. כמובן, בליווי יין המותאם לכל מנה. נדמה לי שהארוחה הזאת זכתה באיזה תחרות. תמונות, המלצות והוכחות נוספות יונפקו לכל דורש. אגב, בקבוק אחד לפחות עשה את הדרך משם עד לישראל יחד איתי. יאללה תביא תמונות. וטקסט. ותכתוב כבר על המסעדה בשיקגו! !